Heartlines lyrics Lorde and The Broods - The lyrics to Lorde's songs from Melodrama and Pure Heroine. 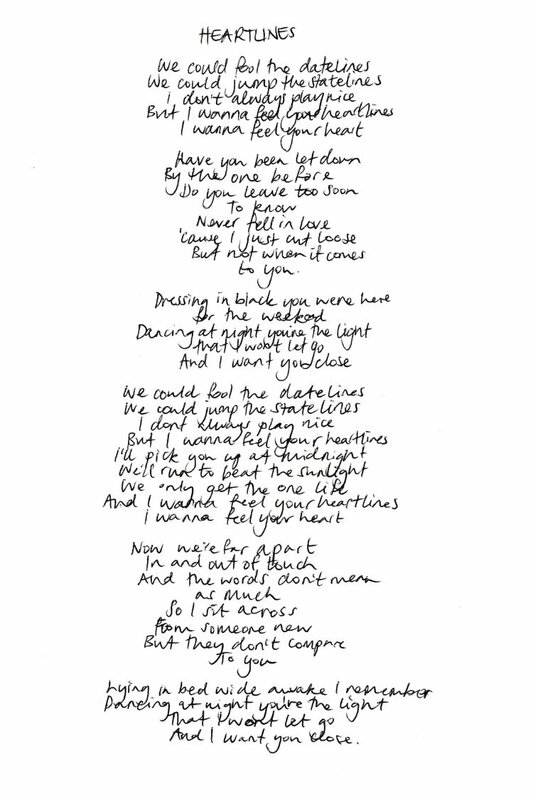 Heartlines' lyrics were co written by The Broods and Lorde. The song features on The Brood's album, Concious. The Broods are an act from New Zealand like Lorde is so it's nice to see her helping out fellow musicians by boosting their profile - not that the Broods are doing poorly, they've had a fairly successful couple of years. The connection between Lorde and The Broods which led to this lyrical collaboration is that Lorde's producer Joel Little was a judge and a music competition that The Broods won. Want more song lyrics from New Zealand's biggest musical export since Neil Finn? Check out the lyrics to Yellow Flicker Beat from the Hunger Games Soundtrack and also Lorde's collaboration with Disclosure, Magnet.